Our Coco Peat/ Coco pith Briquettes are 100% natural organic growing medium which gives a higher volume if it is in a compressed form. This one liter block can be expanded up to 8 liters by adding 2 liters water. Our company is the major supplier of 650 gram Coir Pith Briquette to the overseas buyers for their clients of Departmental Stores, Nurseries and Agriculture dopots. Produced to the needs of overseas customers either individual packing shrink wrapped or pallet packing. We bring forth our vast industrial experience and expertise in this business, involved in providing Coir Pith Briquette. We have gained a remarkable position in the market that is involved in offering Coir Pith Briquette. Being a customer-focused organization, we are engaged in offering 650 Gm Briquettes. We offer these compressed 650 gm coco peat briquettes (TCP6) along with dimension (0.5 cm): 20 x 10 x 5 cm.. Matching up with the ever increasing requirements of the customers, we are engaged in providing Coir Pith Briquette. Our company holds vast experience in this domain and is involved in offering Coco Pith Briquette. We are highly acknowledged organization engaged in presenting remarkable range of Coir Briquette. 650 gram briquettes are ideal for home gardening and hobby growers. Briquettes are perfect for a variety of flowering and vegetable plants. Specially for Orchid flowers cultivation. Sai 650 & 500 gram briquettes are available unwrapped or individually shrink wrapped with label and palletized as per customer requirement. Our organization is instrumental in providing excellent quality of Coir Pith Briquette. This is widely used in commercial complexes, households, gardens for diverse purposes. Our range help us to improve the water retentive and permeability properties of the soil. We offer our range at market leading prices. 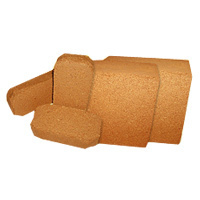 We offer a wide range of Coir Pith Briquettes safely packed with high quality stuff. The offered range is widely used in gardens, commercial establishments and in households for diverse purposes. There is a huge demand for this product in all kinds of agricultural processes. Compressed 650 Gm Coco peat Briquettes (TCP6) : Briquette dimension (0.5 cm) : 20 x 10 x 5 cm Unit Weight (3%) : 650 Gms Moisture : 10-15 % Compression Ratio : 8:1 Dehydrated yield (Litters) : 9 liters. Packing : Palletized- stretch wrapped & strapped / non-palletized bare block loading on container floor. Our company has gained name and fame in offering Coir Pith Briquette to the clients. 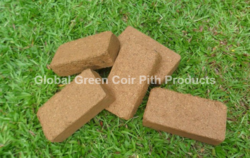 Coir Pith Briquette is manufactured using best quality material and state of the art technology to suit the various preferences of our customers by our vendor's. This product is available in different designs as per the client’s demands.